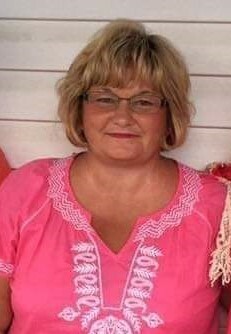 Marie Deen Johnson, age 54, of Baxley, passed away Monday, March 25, 2019 from injuries sustained in an automobile accident. Marie was born April 12, 1964 in Bacon County to the late Darlin Denny Deen and the late Elizabeth Janie Yawn Deen. She was formerly employed at Interstate Credit Union and was once a Bus Driver for McDuffie County School System. Survivors include her husband, Ricky Johnson of Baxley; daughter, Taylor Johnson of Baxley; sisters & brothers in law, Teresa & Clyde Eason of St. Mary’s, Patty Tanner of Lumber City & Rhonda & Kip Davis of Baxley. Funeral services will be held Thursday, March 28, 2019 at 4:00 p.m. at the Chapel of Swain Funeral Home with Rev. Mark Grimes officiating & a eulogy by Nathan Wiggins. Interment will follow in the Appling Memorial Gardens. Active pallbearers will be Scottie Tanner, Josh Eason, Mitch Eason, Austin Lott, Gene Thompkins & Craig Causey. Remembrances may be made to St. Jude Children’s Research Hospital, 501 St. Jude PL, Memphis, TN 38105-9959.